WHOSE THE NEXT TO RISE OUT OF THE L.A. HIP-HOP UNDERGROUND? With groups like Jurassic 5 and Dilated Peoples achieving mainstream success in the last few years, the Los Angeles hip-hop underground is finally getting to showcase to the mainstream unique blends of hip-hop, jazz and poetry that have spawned groups such as Freestyle Fellowship and The Pharcyde, and MCs like Aceyalone and Abstract Rude, thus creating a sound that is uniquely L.A. Who will be the next big thing to represent the sounds of Los Angeles? Leading the pack for '03 is Busdriver (a.k.a. Regan Farquar), who is a veteran of the late-'80's/early-'90's underground hip-hop scene. Farqhar penned his first songs at the young age of 13, started his first group, 429, right after the L.A. riots, and has been making music every since. This charismatic MC has been a frequent collaborator over the years with MCs such as Aceyalone and Of Mexican Decent, as well as producers Fat Jack and Daddy Kev. Busdriver got his name from a friend because of the fact that he was a frequent user of public transportation. Bus's latest release, Temporary Forever, is a unique mixture of gritty underground beats, jazz samples, spoken word, precise spastic vocals and poetry that has been warmly received by critics in 2002. It has even landed him a spot in URB Magazine's next 100. The accomplished MC was featured on this year's Smoke Out fest and toured Canada earlier this year. Producers Daddy Kev and Paris Zax handle most of the production on the album with a new, cool, laid back, alternative sound for hip-hop. "Paris and Daddy Kev really did their job," said Busdriver,"I love working with Paris because people don't really know about him and he is really talented. He has a very uninhibited style and can go a lot of different ways. He really shines on the album. Kev is always a pro and has very concise ideas." Busdriver has another release on Mush Records - Touch Type b/w Winthorp & Winthorp - as well as others on Celestial, Massmen and Afterlife. Bus and his crew are artists who are truly out for the people and the enjoyment of putting out good music. "We don't live or die or depend on one album," said Busdriver. "If I put out an album and it doesn't do well, I keep putting things out anyways. It's based out of the culture of the scene rather than the expensive one album. A lot of these artists that are coming out now aren't feeling anything." 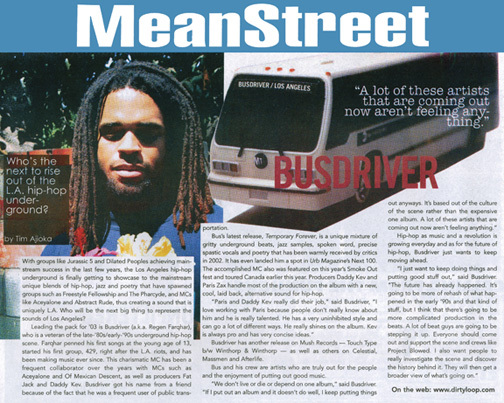 Hip-hop as music and a revolution is growing everyday and as for the future of hip-hop, Busdriver just wants to keep moving ahead. "I just want to keep doing things and putting good stuff out," said Busdriver. "The future has already happened. It's going to be more of rehash of what happened in the early '90s and that kind of stuff, but I think that there's going to be more complicated production production in the beats. A lot of beat guys are going to be stepping it up. Everyone should support the scene and discover the history behind it. They will then get a broader view of what's going on."